Robinson’s are delighted to announce that the spring summer 2016 Barker footwear collection is now available, so there’s no time like the present to treat your feet to new season styles. With that in mind, we’ve complied a ‘best of’ list highlighting the best spring summer 2016 shoes for men, and we think you’ll love the updates to some of the classic styles on our list. No matter the occasion, a new pair of loafers will see you right in any smart casual setting, and you won’t go wrong with the new Barker Davenport loafers, available in either black or cedar calf leather, or tan suede for a more relaxed look. Pair with a pair of linen trousers or light chinos for a chilled spring summer update to your wardrobe. These comfortable shoes will soon be a firm favourite in your wardrobe for the new season of style ahead. Summer shoes are all about keeping your feet comfortable, and these Barker William moccasins certainly fit the bill. Many people are sceptical of wearing moccasins like these for fear that they look too similar to slippers, but when the weather is hot and the occasion calls for fancier footwear than sandals these are the answer. Spring and summer are the perfect seasons to lighten and brighten your style too, so why not choose a different colour than you normally would for your other shoes? The blue suede pair is a versatile option, perfect for wearing with chino shorts and a light t-shirt. When those hot summer days roll around, what better way to keep your feet cool than to slip into a pair of driving shoes for a drive about the coast or country (even better if you can put the top down in the car), and we think you’ll love these Barker Denby driving shoes, now available for the new season. These shoes are also perfect for soaking up the sun on the deck of a private yacht – or just strolling around the park on a nice day (whichever is more your style!) They’re breathable, lightweight and comfortable, and come in two colour options – cappuccino or navy suede. This classic shoe silhouette has been around for generations, before evolving to be the stylish summer wardrobe staple it is today. Get yours now in time for better weather to come. 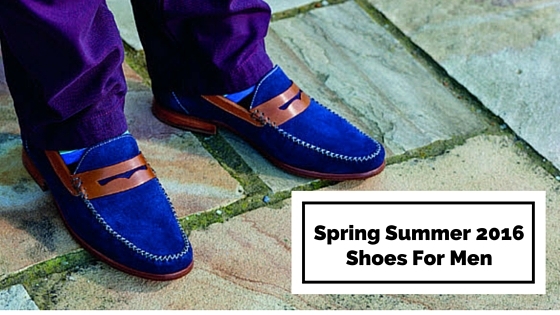 See the full range of spring summer 2016 Barker shoes now. All Barker shoes are hand shaped for superior comfort and fit, and only the best quality materials are used to ensure a beautiful result and a shoe that will be a smart yet stylish investment.